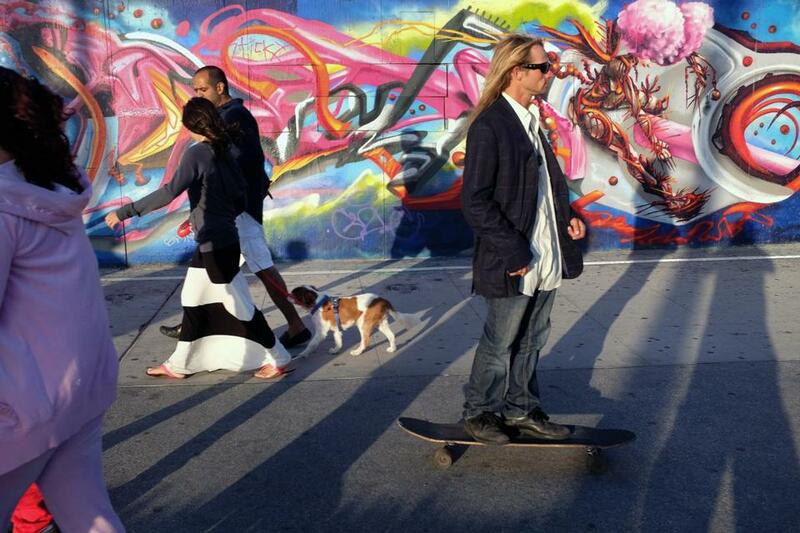 The eclectic mix of Venice Beach’s famed boardwalk has been expanded with the arrival of high tech entrepreneurs. In the past few years, Google, Microsoft, Facebook, and YouTube have opened offices on the west side of Los Angeles from Santa Monica south to Venice and Playa del Rey. They are joined by hundreds of startups including Hulu, Demand Media, and Snapchat, which nixed a $3 billion takeover offer from Facebook. Major Hollywood players Walt Disney Co. and Time Warner Inc.’s Warner Bros. have launched startup accelerators to help local tech entrepreneurs. Los Angeles even hired its first chief technology officer, former Qualcomm executive Peter Marx, earlier this year. ‘‘Historically, Silicon Valley has been the center of gravity for tech and startups, but I think more and more these types of companies can be built anywhere,’’ said Erik Rannala, who moved from San Francisco to Los Angeles with his entrepreneurial partner William Hsu several years ago. Rannala and Hsu oversee MuckerLab, a technology incubator in Santa Monica that has invested in 45 startups such as flower marketplace BloomNation and an online tuxedo rental outfit, the Black Tux. Many of the ideas for the companies were hatched in MuckerLab’s concrete-walled space, which is covered with white boards and sticky tabs. The area’s vibe is eclectic. No office-park chic here. Graffiti murals mix with coffee shops, foodie scenes, and boutiques. Companies allocate ample space for bikes and surfboards so employees can hit the beach after work. Social media software maker Epoxy TV, founded by Juan Bruce and Jason Ahmad, is based in a Venice complex formerly owned by the late actor Dennis Hopper. They still get his mail. One of Hopper’s sculptures adorns the yard, and inside there’s a staircase to nowhere designed by renowned architect Frank Gehry. The Venice scene also has helped online razor service Dollar Shave Club recruit employees, according to its founder, Philadelphia native Michael Dubin. What’s happening here is part of a growing movement of US cities seeking to duplicate the formula that turned Northern California’s Silicon Valley, slightly south of San Francisco, into a mecca of society-shifting innovation and immense wealth. Cupertino-based Apple Inc., Mountain View’s Google Inc., and Menlo Park-based Facebook Inc. collectively have created more than $1 trillion in shareholder wealth while routinely paying employees six-figure salaries, generous benefits, and stock options that can generate multimillion-dollar windfalls. All the prosperity has caused the cost of living in Silicon Valley to soar. It’s nearly impossible to buy even a small home for less than a $1 million in San Francisco and many other nearby cities. Tiny apartments can cost $2,500 to $3,500 per month. Prices like those are one more reason that less expensive but still enticing places such as Los Angeles make sense to tech entrepreneurs, said Chris De-Wolfe, who runs the rapidly growing Social Gaming Network in Beverly Hills. Los Angeles, however, has yet to give birth to a city-defining company in the same way that Facebook, Google, and Apple have defined Silicon Valley or how Amazon and Microsoft have reshaped Seattle. On the other opposite side of the United States, New York’s ‘‘Silicon Alley’’ has been a high-tech cove for the past 15 years. Boston and Washington, D.C., also have had some success cultivating a vibrant technology scene. Billionaire Steve Case, who cofounded AOL Inc. in Virginia, is trying to spread the tech gospel in US cities that have been brushed off as rusty relics of a bygone industrial era. In June, Case visited more than 100 entrepreneurs and startups during a bus tour of Detroit, Pittsburgh, Cincinnati, and Nashville that he called the ‘‘Rise of the Rest.’’ This month he followed up with another round of technology-preaching stops in Minneapolis, St. Louis, Des Moines, Madison, Wisc., and Kansas City, Mo. ‘‘This tech phenomenon in other parts of the country besides Silicon Valley is only going to increase as it becomes easier and cheaper to start companies,’’ Case predicted. DeWolfe said he had trouble luring technology engineers to Beverly Hills a decade ago when he was trying to expand MySpace, the social networking forerunner to Facebook that he cofounded. That’s no longer a problem now that there’s a steady stream of graduates with engineering degrees from local colleges CalTech, UCLA, and USC, said Marx, the city’s new chief technology officer. Those students are flocking to local universities inspired by Southern California’s own success stories. In the first nine months of this year, venture capitalists invested $1.6 billion in startups based in Los Angeles County and neighboring Orange County. That’s up 26 percent from the same time last year, according to PricewaterCoopers and the National Venture Capital Association. That’s still a pittance compared with Silicon Valley, where venture capital investments nearly doubled to $17 billion during the same period.